I was on the train. I was staring glassy-eyed out over the blur of green that is the leafy North Shore. That’s when I first heard Snakadaktal on Triple J. The song was “Fall Underneath”- a catchy synth-pop delirium that made me sit up in my seat and really listen. After that, I tracked down the band on Triple J Unearthed which led me to their older stuff, like “Air”and “Chimera”. I was hooked, so I bought their latest album- Sleep Underwater. 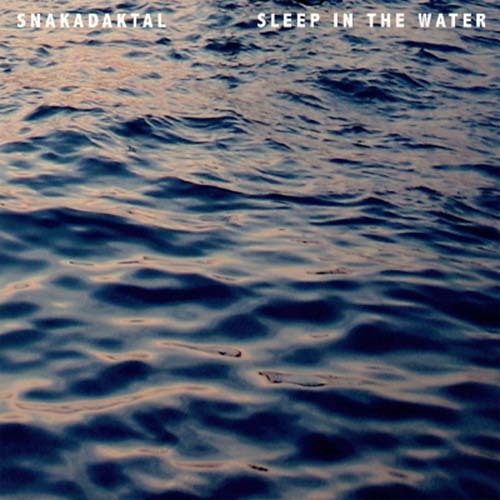 Snakadaktal has an extraordinary talent for manipulating tone or mood through tempo. This is really obvious in “Chimera” for example. It’s hypnotic and I love it. Their synthetic soundscape is lethargic and the female lead, Phoebe Cockburn’s voice is melodious, like a lullabye. Their guitar-work is not exhaustive or overstrained but underlying and crucial. There’s enough to show talent and supplement the tune. The beat can shift from dance-pop in “Feel The Ocean Hold Me Under” to a slow, eerie nostalgia in “The Sun II”. Right after that, a tune like “Ghost” emerges with a simple supporting tone and a female voice hauntingly rhythmic and high. “Ghost” can only be described as the colour metallic navy blue, I don’t know how else to explain it. Wikipedia categorises their genre as indie-pop/dream pop and I’d have to agree with the latter. “Fall Underneath” remains a song with the Snakadaktal signature, with electro-pop sounds that are experimental, but I promise they work. They bring up the beat and get the whole upper torso bopping along. Not something for a dance rave, rather, this tune is a mood-lifter, something I’d listen to turned up loud as I walked through the early sunlit streets of somewhere like The Rocks; empty, fresh and I with a spring in my step. A mood-lifter, that’s what you really want in an opening to an album. After the first track, the up-beat groove remains in songs like “Isolate”, then after that, their tunes become more stereophonic, a sort of haunting beauty that reminds one of a darkened coastline- the muddy grey of the ocean on an overcast day. It echoes, it’s authentic and it’s so well-polished, showing a clear development from the band’s debut songs on their Triple J Unearthed profile. From Melbourne in Victoria, I’m glad we’ve for a new Australian act and I hope they see some bright stage lights in the near future. “Woman On The Run” is the latest album from the Dorothy Jane Band. Dorothy-Jane has a reputation as Australia’s Queen of the Blues Harp and in 2012 she was a top 3 finalist in the Australian Blues Music ‘Chain’ Awards. This new album is a great showcase of Dorothy-Jane (DJ)’s talents as a singer-songwriter working in neat cohesion with her band. Her vocals are like a full-bodied red wine, they’re a little husky, deep and powerful. Her voice is mesmerising, it tells a story and her harmonica is hypnotic. This music is very nice, it’s comfortable and it’s familiar as being part of the soul and blues genre. Baz Cooper on the keys is a shining talent as well which sparkles throughout every tune; both in DJ’s originals or tracks from Canberra bluesman Dean Edgecombe, like “The Same Old Blues”. Tunes like “Boom Bam Bop” are wonderfully frivolous and are guaranteed to get you up and dancing with a beat like the chug of a train and featuring keys and harmonica. The band is so well polished, very professional is it’s execution of song dynamics and the atmosphere is groovin’ funky. Songs like “Mango Ice-Cream” make me want more of DJ’s voice. The backing drums and bass are great, the keys solo is impressive as ever, but I want more vocal power, some raw, passionate, unleashing of a vocal dragon or something later in the tune and I get this feeling with every tune. The music is wonderful, I just want more of her voice, a bit of unchained glory to give more dynamics to the song. It does happen a little towards the end of this tune, and don’t get me wrong, this is a good sign, because I admit, I want more. Throughout the album it’s like she whispers in your ear, like in “Shake Don’t Stir, and it’s so tantalising, but I can hear the raw power within. Let it roar! 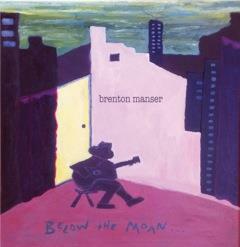 Brenton Manser’s recent album; “Below the Moan” is a quaint little tribute to roots and blues and in its simplicity, the album reaches the listener. Tracks like “Losin’ Ground” are really stripped back to a piano, guitar and vocals composition and that’s what makes the track sweet, authentic and in its high-degree of sound control, the compositions feel effortless. It’s interesting. “No Wind Blowin’” with slide guitar and other support give the sound a southern twang and the sounds are perfect in collaboration. It doesn’t need any cymbals, bells, glitter or forced percussion anarchy, it just needs the acoustic guitar and a few backing vocals. This album had me pleasantly surprised, to be honest. I think that because you can hear every note, every slide, you can appreciate the clever craft just that little bit more. You can appreciate how it sounds like a genuine tribute to early blues music, but at the same time, it’s has a unique signature as a modern roots band, especially in tracks like “Traitor’s Gate”. It sound professional and polished, something you’d find on a road film, something with long sweeping plains of golden wheat at dusk. Dynamically, they’re got a complete sound, songs like “Crestfallen Man” that rise and fall naturally. It’s wonderfully refreshing to have a band that strips naked the blues and roots genres and just sings to the bare skeleton- the beat, the bass line, the acoustic and passionate vocals. Lightly scented candles mix with the warm delight of good food being cooked in the kitchen, as I explore the upstairs landing of The Balcony Bar. Quaint little tables and chairs hang over a balcony overlooking Erskine Street, just a short walk from Wynyard station. Inside, plush lounges and couches allow for a comfortable, languid setting, the kind to hypnotise you into a calm lull. The Balcony Bar is a thin terrace-gone-bar and rather sheek, very trendy. Deep red, almost black walls darken both upper and lower landings. It truly makes you feel like you’re cocooned in the warm lap of Aphrodite, while chalked on the walls are quotes of food and wine appreciation. The bar isn’t dark, though, and it’s not ominous. It’s snug and cozy, but at the same time, it’s elegant and sophisticated in its simplicity. Vanilla prawns were the most delectable surprise on the menu. So sweet, saccharine enough that if the sauce was by itself, the dish would be too much like a dessert. When vanilla beans and honey are mixed with prawns, however, the result is a subtle, mellow blend of warm goodness. The sweetness doesn’t overpower the taste of the prawns, rather, the sauce lightly serenades the seafood. The Pork Belly was juicy, tender and the sauce was just right. The meat was fall-apart and crunchy in all the right places and, not too fatty. This dish was nothing less than moan-worthy good because it tasted a little homemade. It’s as if the goddess Hestia cooked this dish herself. Although it’s a bar, they offer main meals, lunch, dessert and tapas, alongside their vast selection of wines, beers and cocktails. The food, however, is full-bodied and flavoursome. It takes just one element and cooks it right, like a sweet prawn. It’s homey simplicity, it’s so yummy. The French Meat tasting platter is a new addition to The Balcony Bar menu. A selection of pates, chorizo and more accompanied by lightly dressed cherry tomatoes were an assortment of tasty little morsels that left me wanting more. The Teriyaki Salmon was drenched in a molasses-like teriyaki sauce, and the fish was perfect. The salmon was tender, flaking in its delicacy. Flavoursome and full-bloded, the salmon was oh-so satisfying. Last but not least, the home-cut chips were just so great. When you try home-made chips these days, they generally end up tasting like every other chip in the world. These were different. They were soft, they had a light crunch and, they were identifiable as potatoes. Salted and served with homemade barbeque sauce, these chips had a rustic authenticity to them and they were just really yummy. The Balcony Bar is a recent addition to Erskine Street which opens for lunch and dinner on weekdays and has just begun opening for dinner of Saturdays. They’re open to private functions as they have ample room with over two stories, two bars and plenty of places to sit and relax. The staff are more than accommodating and gentlemanly and I was very impressed with the venue. If anything, I’d go back just for the Pork and Prawns. 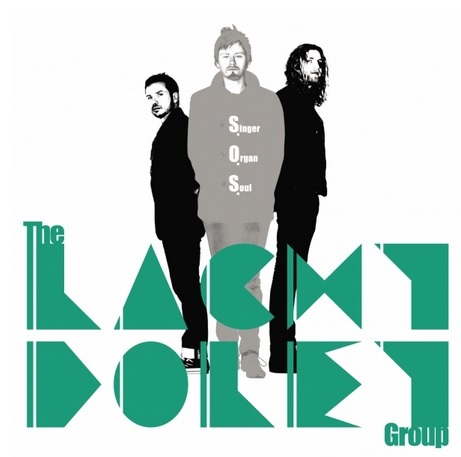 The Lachy Doley Group’s second album “S.O.S- Singer Organ Soul” recently made its debut and the group has been touring nationally for the last couple of months. Their album is rusty and husky and has a professional quality without the studio polish. Their album has the atmosphere of a live performance and the passionate energy of one too. It swings between a slow Soul kinda vibe, then hits the heights of a Blues Festival, without the festivities. The group’s front man, Lachy Doley takes care of the 1957 Hammond C3 Organ and Honher Whammy Clavinet, while also lulling us into a hypnotic trance with his gritty lead vocals. The Hammond is wonderful. It’s used sparingly, but when used it’s so appropriate and groovy and I just want to shake my tail feather. When in collaboration with drums and bass guitar, the tunes are dynamic and the release of tension is so great. “The Underground” is a great example of the hold, then the tsunami of sound, then the experiment with tempo and the confidence in each instrument. Such a great knowledge of a number of genres, soul, blues, pop, funk; this band fits into all and none. It’s a sound that’s familiar, but you’ve never heard them before. It’s an album you’d have playing over the top of a record store, something to get your toes tapping, something to lift up your mood. I like it. If anything, I’d probably like to hear if there was a difference in their tunes if they were professionally recorded in a studio, but on the other hand, I think their earthen gruff from the vocals is all that would change and to be honest, their control of their enthusiastic energy is enough. I think the live-cracker nature of this album makes it authentic. “Not Mistaken” is a good example of their album in its complete sound- it has all out vitality, then quiet control, then impressive solos and the layering of husky vocals. It’s like a thorough package. After something like that, they do something slower and more restricted, like “I Don’t Want To Be Forgot”- it’s just great versatility. 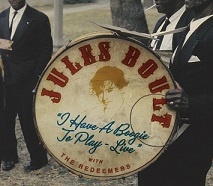 Jules Boult’s album “I Have A Boogie to Play- Live” is a great experience. I love some of the more traditional tracks like “Down By The Riverside” and “I’ll Fly Away”. His renditions are very interesting. The brass solos, piano and the groovy-boogie atmosphere make the tracks drip with Ye Olde-American legitimacy. It makes them sound as if they should be played in an old saloon or a spaghetti western parlour before a crazy-hellfire standoff at dawn. For me, each instrument is impressive and together they form a nice, familiar and warm sound. My favourite moments in tunes like “Down By The Riverside” are the solos where there is less emphasis on the vocals. This may just have been the equalising though, as the album was recorded live and this aids to the vibrant energy of the CD. On the other hand, tracks that use the drum set less really bring out the sweet harmonies in the vocals, tracks like “Needed Time”. In this song, there’s more general percussion like tambourine and bells as well as ukulele and it just seems simple and effective. In its stripped back state, this traditional tune is wonderful, I really connect to it, I want to stick on a heavy muslin dress, curl my hair and dance around an old saloon. With such a variety of talent in this band, I think less is more. Again, “Mark My Words” is a song where the vocals, the lead and backing, are all sensational and atmospheric, but that’s because there’s little to haze their husky, rusty quality. Tracks like “I Held My Baby Tight” are wonderful in creating an energy and the piano adds just that spare bit extra. When controlled and moderated, this band knows to sell their sound with passion. I think I prefer the less complicated tracks and that’s just my preference. Being a live recording, you can hear the whooping and hooting of the audience in the background. That really adds to the whole experience. 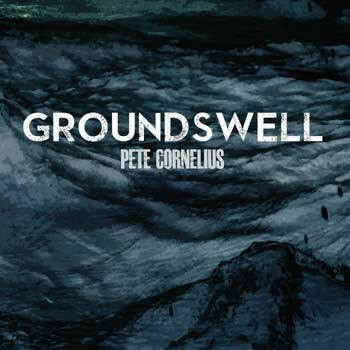 Pete Cornelius grew up as far away from the Delta heartland as is almost humanely possible. He’s never picked cotton, never hitched a ride on a freight train, nor traded with the Devil. Not knowingly, anyway. This introduction of the 29 year old Tasmanian is just as quirky and smile-tugging as his opening song, “Drinking the Blues”. It’s not that there’s anything humourous about his music, oh no. Rather, that his sound is so well-polished and collaborated, with a nice lazy beat that I can’t help but to smile in recognition; This Is Good Music. “Love and Happiness” is a song that really suits his voice, his vocals are a bit country, but his keyboard is a bit groovy, a bit woozy. The ambience is laid-back and the bass line is quietly embracing. The guitar riffs are exceptional and the whole tune, chorus especially, is catchy. It’s a bit funk, it’s a bit everything. It’s a solid piece of music. I close my eyes and think- where am I? I’m envisioning myself in a mature café/restaurant, sunk into low-backed brown leather seats, beer in hand, hand resting on my worn jeans and, there are framed and signed records on the walls. Playing is track number 3; “Right Place, Wrong Time”. For the music to give me these day-dreams is a wonderful talent. It’s casual, it’s quiet and the dynamics are appropriate and well controlled. The guitar riffs are well-placed and what I love about it is that it’s not strained, that it doesn’t seem forced to put these solos in, the back-up drums aren’t just going nuts for the sake of it- it’s clever in collaboration and it’s fluid in momentum. Each track transports you- “Talkin’ Bout New Orleans” puts me in Louisiana and I haven’t even been there. It’s great to hear differentiation between sounds and tracks because in an album, you don’t want to be hearing more of the same. It’s like there’s a different influencing genre on each song, because after that track, you’re listening to “My Soul” which is a bit country/rock. Great versatility, nicely refined.